I have released the final version of the CDK-Taverna 2.0 plug-in yesterday. The plug-in supports Taverna in the latest version 2.3 and the CDK in version 1.3.12. I thank everyone contributing to this project and the developers of such great software libraries and applications like Taverna, the CDK, Weka, IText, JFreeChart and many many more. The URL for the Taverna plug-in manager is http://www.ts-concepts.de/cdk-taverna2/plugin/. For further questions, feel free to contact me at cdk-taverna2@ts-concepts.de. Egon was so kind to blog about his experience about installing CDK-Taverna. I am happy to announce the release of CDK-Taverna version 0.5.1.1. This release is usable with the Taverna version 1.7.2.1 and you can install it from within the Taverna Plug-in Manager. There you have to add the following plug-in site http://cdk-taverna.de/plugin/, as explained in this installation howto. 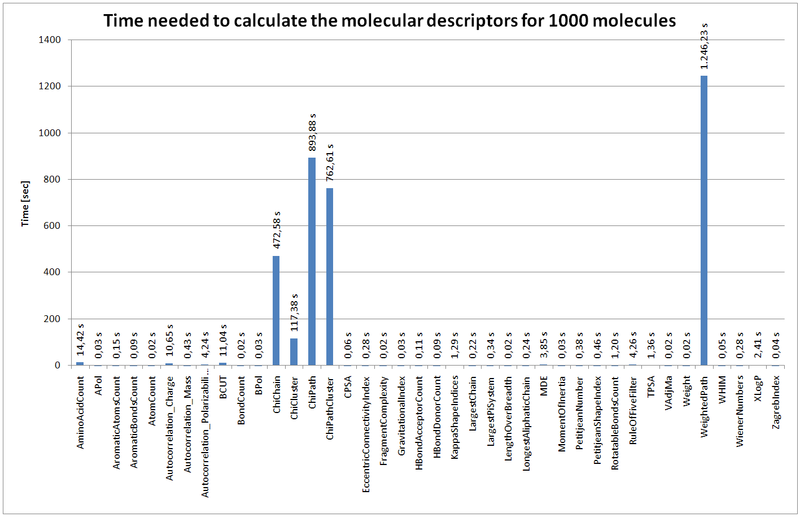 To estimate the time needed to calculate molecular descriptors for many molecule (more than 200000) I created a workflow which measured the time needed to calculate each molecular descriptor. This workflow can be found here. During some work on natrual products I analysed a proprietary database with over 180000 molecules with the help of cdk-taverna. The aim of the work will be a diversity analysis of natural products. Therefore I have to calculate some molecular descriptors from the cdk. But before I could calculate the descriptors I have to check whether the cdk could handle these molecules or not. 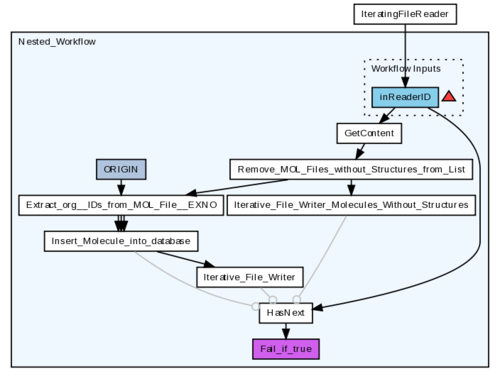 Therefore I develope workflow to test how the cdk performs with natural products, especially how many wrong or missing atom types will be detected within this public database. For the proprietary database of natural products which contains over 180000 molecules the cdk had only problems with 1350 molecules. Which is less than 0.8 % of the molecules. 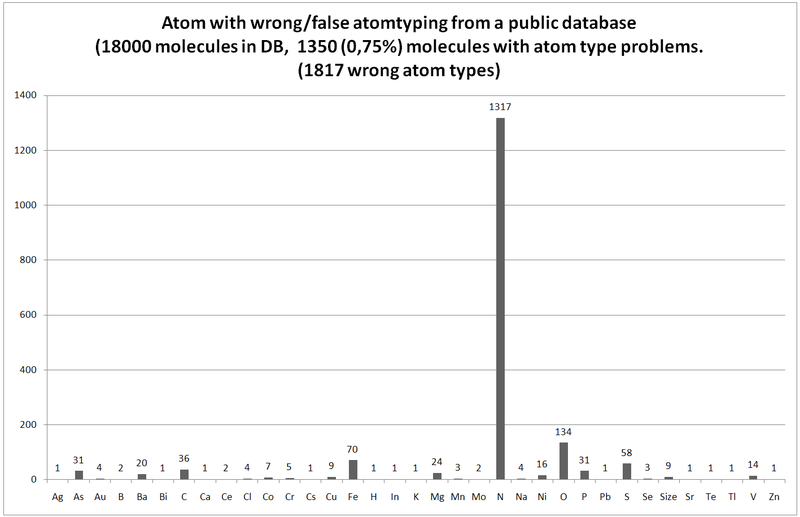 These molecules has 1854 wrong or failing atom types. The large number of wrong nitrogens is mainly caused by five bonded nitrogens for which the cdk currently has no atom type defined. www.myexperiment.org is an open platform which allows users to share their workflows. Today I started to upload workflows to that platform. The first workflow I have uploaded loads molecules using an iterative file reader from a MDL SD-file. Each molecule gets stored within a Postgres SQL database which uses the Pgchem::Tigress extension. Egon found a publication some time ago which mentioned the CDK-Taverna plug-in. You are currently browsing the archives for the cdk-taverna category.